Over 175 Rental Forms by Jeffrey Taylor, founder of MrLandlord.com. Get over 175 RENTAL FORMS that will make you more money and help you take control of every rental situation! This informative book includes 50 money making management tips and the best rental forms that I've developed over 30 years as a landlord. 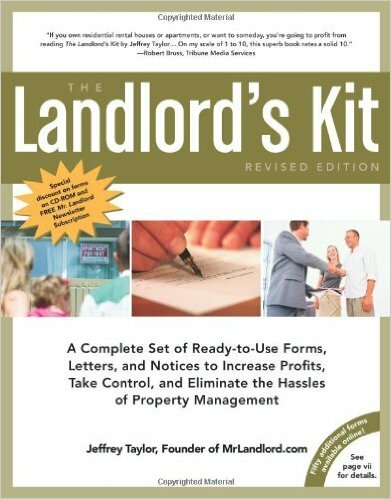 I have learned a lot and much of what I've learned is now in this bestselling book - THE LANDLORD'S KIT. THE LANDLORD'S KIT gets high praise from my friend and colleague Leigh Robinson, who wrote the bestselling book LANDLORDING. Here's what Leigh has to say about THE LANDLORD'S KIT - "Good forms make the good landlord a better landlord, but they require a lifetime of writing and refining. Now comes Mr. Landlord, Jeffrey Taylor, to share his many good landlording forms developed over his lifetime for all of us. Bless him!" The single most ant activity of a rental owner is what you communicate to residents. With this book you will now have a form to help you take total control of every rental situation, generate more monthly cash flow, and have less headaches. This new book also shares some of the classic money making strategies and tips that Jeffrey Taylor, editor of MR LANDLORD, shares at seminars. Jeffrey Taylor is a master communicator, and is the nation's number one landlording coach. These are the money making management concepts and forms that Jeffrey personally uses to be successful (and used by thousands of rental owners nationwide to increase their profits). THE LANDLORD'S KIT is a highly recommended resource for any one who owns at least one rental and a necessity for those who own or manage many. I guarantee you, that as a rental owner you will use or refer to this book more than any other real estate book you own, because it deals with how to effectively communicate with residents at any and every stage of the rental process. 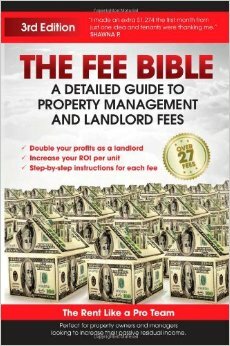 If you visit MrLandlord.com, you've got to have a copy of this book! And here is the absolute best news. This revised, 226 page book (8 1/2x11) is only $18.95. We have never before offered so much for so little of a price! THE LANDLORD'S KIT was listed as one of the top 10 bestsellers on barnesandnoble.com, on their Top 100 bestsellers list of ALL books offered. At Amazon.com, where it has been listed as high as #7 on Amazon's Top 100 Bestseller list (out of the millions of all books they offer, not just real estate). It's amazing to me that for less than twenty bucks, you can obtain over 175 forms that has taken me over 0 years to refine, and includes 30 years of hard-earned lessons! If you have not already gotten your copy, click now to order it. As a landlord, this will be one of the the best twenty bucks you ever spent! Buy the book right here with at least two other books and receive the 10% "multiple order" discount off ALL the books your buy.